The Crook County Cowboys pulled off a minor upset on Wednesday as they ran away with the Intermountain Conference cross country championship. Heading into Wednesday's race at Crook County, The Dalles was ranked third in the state and was favored to win the title. Instead, the Cowboys, who were ranked fourth in the state, pulled away to win the title by 22 points. Crook County finished with just 28 points as they packed all five of their scoring runners into the top 10 in the race. Hood River Valley was a surprise second with 50 points, while The Dalles was third with 51. Rounding out the field were Ridgeview, 115, Redmond, 118, and Pendleton, 156. "The Dalles was ranked third in the state in a hypothetical meet by their times," Crook County head coach Tracy Smith said following the meet. "And they got third at district, so that tells how hard our district is." As they have done all year, the Cowboys started near the back of the pack and slowly worked their way to the front. By the one mile mark, four Cowboys were in the top group, and as the race went on, Crook County continued to move to the front. With just over a mile to go, three Cowboys were in the lead pack along with a pair of runners from The Dalles and two runners from Hood River Valley. 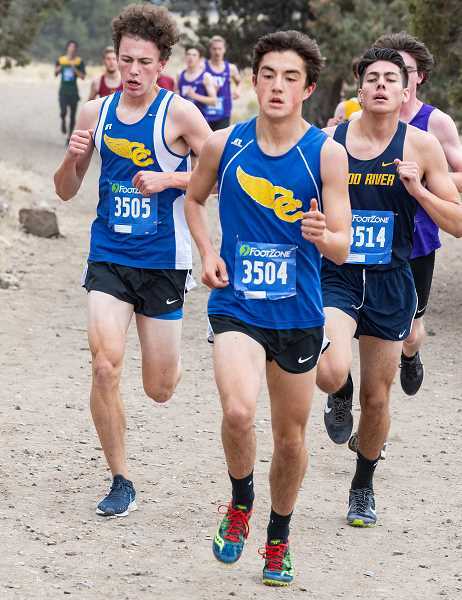 However, Crook County's Cade Catterson, a junior, surged to the front, running away from the field in the last mile to win by nearly 30 seconds. "Well, I was just going to ride on them and then break them down and pass them with about a mile to go," an ecstatic Catterson said of his strategy. "I just kept speeding up." Catterson's time of 15:59.49 was the fastest time of his career and is currently the 10th fastest time in Class 5A. "We felt that he was going to do that," Smith said of Catterson's performance. "We've been telling him all year that he could run under 16, and we knew that even though there was a guy on one of the other teams who had run 15:55 that Cade could do it." That runner was Sam Alvarez of The Dalles, who finished second with a time of 16:24.07. Hood River Valley's Josh Haynes finished third with a time of 16:37.04. Crook County's Alec Carne was next to the finish line with a personal best time of 16:38.28. Next in for the Cowboys was Miles Chaney, who finished sixth overall with a season best time of 16:56.55. "Going into the race, we talked about running it the same way we did at the IMC preview," Chaney said. "Which was get in that front pack and just keep in it and then in the third mile disperse. We kind of dispersed before the third mile, but I feel like the theory still worked, and the end result was better than we were hoping for." Next in for the Cowboys was Jonas Rice, who finished eighth overall with a personal best time of 17:08.03. "My strategy was to stay with my teammates because I am always behind them," Rice said. "I was really pleased, it was willpower and guts." Rounding out the scoring for the Cowboys was Alex Vail, who finished in ninth place with a time of 17:10.83, also a personal record. "We did really good staying in a pack," Vail said. "I wanted to pass two kids on the way in, and I passed one, so I would have liked to do better, but overall, I pr'd, so it was good." 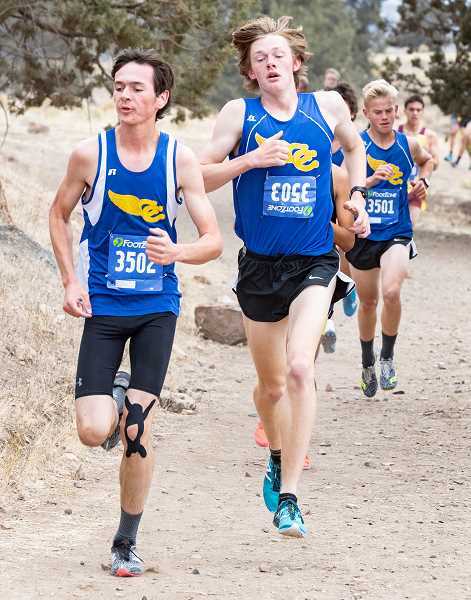 Also running in the varsity race for Crook County were Hunter Eller, who finished 25th with a personal record time of 18:15.57, and Caleb Phay, who also ran a personal best time, placing 29th in 18:27.92. Phay will probably be an alternate for the Cowboys at the state meet as Logan Tanner, who ran in the JV race, finished with a slightly faster time than Phay. Tanner was fourth in the JV race with a time of 18:26.48, just over a second faster than Phay. Evan Despain of The Dalles won the JV race in 17:50.34. Although the Cowboys easily won the team title, the race for the second and final team to qualify for the state tournament was anything but a run away. Hood River Valley's fifth runner finished 16th with a time of 17:33.02, while the fourth and fifth runners from The Dalles placed 18th and 19th respectively with times of 17:35.11 and 17:40.38. Had either of the runners from The Dalles run just four seconds faster, it would have been The Dalles heading to state instead of Hood River Valley. In addition to Crook County and Hood River qualifying for the state meet, Alvarez of The Dalles, Haynes of Hood River Valley, and Omar Quintna, also of Hood River Valley, all qualified for the state meet as individuals. Based on times, the Cowboys are projected to finish fifth at state in a hypothetical meet. However, The Dalles is still ranked third and won't be at the meet, leaving the Cowboys in position to earn a trophy at state. 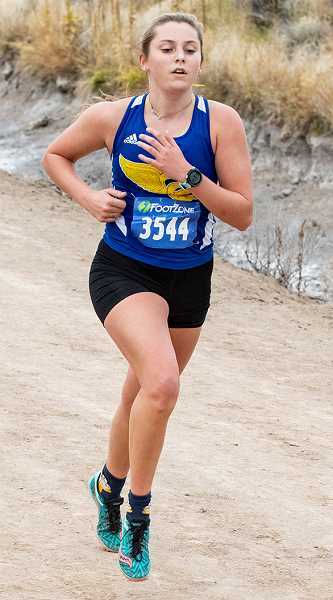 Crook County assistant coach Chuck Coats believes that the team will be even stronger at the state meet and that they can finish in the top two. Should they find a way to defeat No. 1 ranked Crater, Coats has vowed to shave his head following the meet. Last year when the Cowboys won the Class 4A state championship, he shaved his mustache, much to the delight of team members, but this time would be an even more drastic step for Coats. "It's a challenge," Smith said of the move up to Class 5A. "But I think that it is better for our team. They have to press in harder and really focus more and just have bigger goals. They showed today that they can compete against the bigger schools." Although the Cowgirls ran their best meet of the year, they still came up short with no one qualifying for the state meet. Hood River Valley, which finished second to Summit at last year's state meet, ran away with the girls race, finishing with a nearly perfect score of 18. The Dalles came away with second place with 58 points, while Crook County was third with 87. Rounding out the scoring were Ridgeview, 98, Pendleton, 103, and Redmond, 139. The Eagles raced to the first four places in the meet with No. 1 ranked Frances Dickinson winning with a time of 18:51.49. Brinna Weiseth finished second in 18:53.79, Evelyn Nunez third in 19:00.83, and Josephine Dickinson fourth in 19:22.89. "The competition is so much tougher," Smith said of the difference between last year's Class 4A girls race and this year's Class 5A race. "They physically weren't able to do it, but most of them got prs, and we are not getting blown out by the girls." Emma Mullins of The Dalles finished in fifth pace with a time of 19:30.28, while Crook County's Jan Carne was sixth with a time of 20:15.655. The place was bittersweet for Carne, who ran away with the Tri-Valley league championship a year ago. Wednesday's race was by far her fastest time of the year but left her one place short of qualifying for the state meet as an individual. "It's tough for Jan because she won district last year by over a minute and then today the competition is so much tougher. But she's a fighter," Smith said. Carne initially thought that she had finished fifth, only to find out that she was in sixth, just short of qualifying. "It was pretty disappointing for me because I thought that I came in fifth," Carne said. "My goal was fifth, but I ran better each race all year, so I'm happy about that. And we were so close together as a team that we all push each other in this race, which is good. I think that we are only going to get better next year." The Cowgirls knew going in that it would be difficult to qualify for the state meet. Each Crook County runner was given a The Dalles runner to try to beat, and the team did run in a pack right with the runners from The Dalles. Unfortunately for Crook County, by the finish line the, Crook County runners were just behind the runners from The Dalles that they were chasing. "We told them before the race that the only people to look at are The Dalles," Smith said. "We knew which ones were close to certain kids and we said, 'Know their faces. Know what they look like and go after them.' Most of them got prs, but it wasn't quite enough." McCall Woodward was the second Cowgirl to finish, placing 11th overall with a personal record time of 20:51.28. The remaining Crook County scorers were Maggie Ramoss, 21st in 21:27.47, Aubrey Love, 23rd in 21:39.15, and Kelcie Ames, 26th in 21:47.91. The final two Cowgirls in the varsity race were Elise Rice, 35th in 22:37.20 and Mckinzee Mode, 37th with a time of 22:48.69. "I feel satisfied," Rice said. "I think everybody tried their very best, and I'm very proud of my team." Running in the JV race for the girls were Hannah Dozhier, 24:08.95, Jenae Mapes, 24:19.83, Elle Edgerly, 26:53.99, Jillian Nguyen, 27:19.21, Emily Mize, 28:14.31, and Sammy Thornton, 38:10.32. Other Cowboys in the JV race included Xavier Layne with a time of 19:29.08, Jeremy Cartlidge, 19:50.14, Austin Strong, 20:49.45, Jason Slawter, 21:01.62, Elijah Becker, 21:07.14, Tucker Bonner, 22:08.52, and Kaden Ritter 23:06.09. The state meet will be held Saturday, Nov. 3, at Lane Community College in Eugene. Races begin at 10 a.m. with the 3A/2A/1A girls race. The 5A boys race is scheduled to begin at 2:20 p.m. with the final race of the day scheduled to begin at 3:30 p.m.
"We hope to place," said Vail. "But our main goal is just to get there and have fun and have the 5A experience." However, other Cowboys have a loftier goal for state. "We are going to run our hardest, and we hope to bring home a trophy," Chaney said.